The Panama Canal and the Renewable Mandate. Guest Post by Guy Page. It may sound odd, but when I think of Vermont’s pursuit of 90% Total Renewable Energy by 2050, I think of Ferdinand de Lesseps. Never heard of him? He was the creator of the Suez Canal who later attempted the digging of the Panama Canal under the French flag. 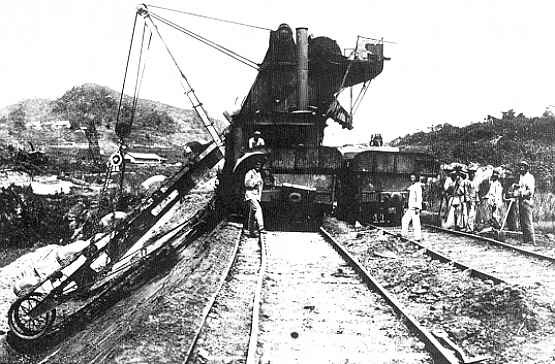 Inspired by his success at Suez and a transcendent if naïve 19th century belief in the unstoppable power of Modern Progress, de Lesseps led the national effort from 1870-94 to dig a “sea level” canal across Panama. When engineers warned the canal couldn’t be finished, de Lesseps counseled faith in France, progress, and himself. After a quarter century, failure was complete: no canal, a bankrupt nation, and 25,000 dead from accident, malaria and other tropical diseases. First, overdevelopment. Instate wind and solar development can’t meet our growing megawatt/hour needs without drastically remaking our treasured landscape. To compensate for weaker output compared to nuclear, hydro and natural gas, wind and solar power require vast acreage, premium siting, and proximity to consumers. Vermont is only just starting to realize what a 90% renewable portfolio will really look like. And it is no good to say Vermont can conserve its way out of overdevelopment. The CEP clearly states Vermont will need more electricity than ever to replace the fossil fuels now energizing our cars and home furnaces. Also, more extreme forms of conservation – the virtual exclusion of the private car, air traffic, and single family home ownership – are unacceptable to the average Vermonter and thus are doomed to failure. Second, wind and solar produce power at nature’s whim, not when we need it. This intermittent power problem makes transmission more unreliable and difficult to manage as the ratio of wind/solar power to total load grows. The purported solution – efficient battery storage – does not exist in applicable, market-ready form. As with the followers of de Lesseps, we are told that technological breakthrough is just around the corner. Skeptics are told to have more faith in progress, and to keep the workers busy and the money flowing. Perhaps technology will solve these problems. After all, the Panama Canal was eventually built – but not where, when, and how de Lesseps had envisioned. U.S. President Theodore Roosevelt learned from France’s mistakes. 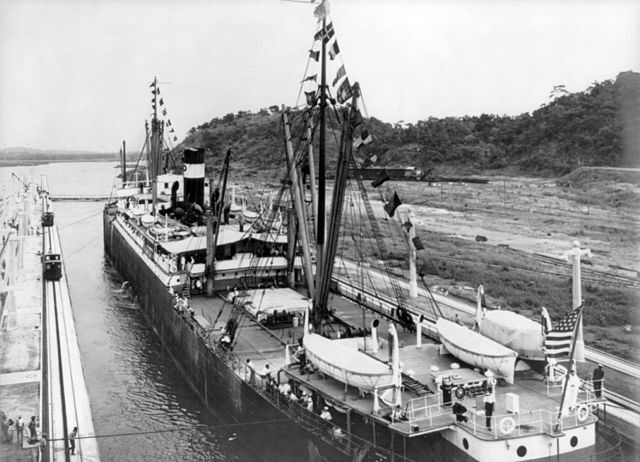 Twenty years after the French plan failed, the United States completed a redesigned, relocated Panama Canal with sound planning and available technology. Vermont should imitate TR and rework its energy future with a plan that doesn’t require landscape devastation or non-existent technology. Carbon reduction, the much-stated reason for a 90% renewable portfolio, can be achieved by state and regional policies embracing existing regional hydro and nuclear power with more deliberate growth in wind and solar. In August, New York State took a bold step by including nuclear power in its clean power portfolio. Vermont and the rest of New England should consider following suit. When (or if) the Big Energy Breakthrough happens – whether efficient storage of intermittent power, or a totally new form of power generation - we’ll be ready for it. Until then - pardon my skepticism, call me plodding and cautious, but our future is too important to leave to faith in progress. Guy Page is communications director of the Vermont Energy Partnership (www.vtep.org). This post has appeared or will appear at several newspapers in Vermont. Page is a frequent guest blogger at this blog: his most recent post is Challenges for Instate Hydro. The purpose of the Consumer Liaison Group (CLG) is to be the voice of the electricity consumer in advising the grid operator, ISO-NE. As the annual report states: The Consumer Liaison Group (CLG) is a forum for sharing information between ISO New England (ISO) and those who ultimately use and pay for electricity in New England. CLG meetings are free, but you should register in advance if you want lunch. Here's the information. The graphic is merely a screen shot, I supply the relevant links below the graphic. I hope to see some of you there. The following letter was sent to those who have attended previous CLG meetings. (The meetings are open to the public.) I was given permission to include the letter in this announcement. As a past (and hopefully future!) Consumer Liaison Group (CLG) participant, you may find this information interesting as you consider your attendance at the September 15th CLG meeting in Providence, Rhode Island. Earlier this week, the six New England Governors joined with five Eastern Canadian Premiers for their 40th Annual Conference. The Conference, hosted by Governor Charlie Baker of Massachusetts, convened on Sunday and Monday and a variety of regional issues were discussed, including trade, energy diversification, and combating the opioid crisis. Much of the Governors’ and Premiers’ focus was on energy as the Conference heard from Federal Energy Regulatory Commission Chair Norman Bay, a panel on “Emerging and Innovative Technologies,” and a second panel on “The Benefits and Importance of Diverse Energy Generation.” While the Conference produced no action items or resolutions, participants and media accounts (see below) alike report productive conversations on a variety of regional energy issues. In September, the CLG will continue these important discussions. 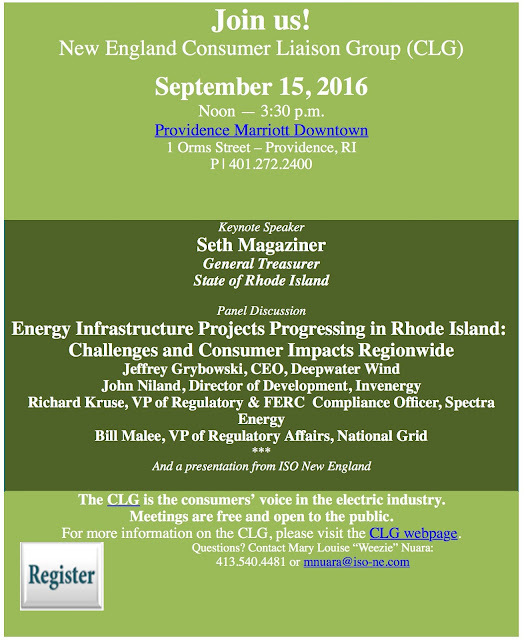 The CLG will hear from Rhode Island General Treasurer Seth Magaziner and a panel on “Energy Infrastructure Projects Progressing in Rhode Island: Challenges and Consumer Impacts Regionwide.” Panelists from Deepwater Wind, Invenergy, National Grid, and Spectra Energy will discuss a variety of generation, transmission, and pipeline projects. 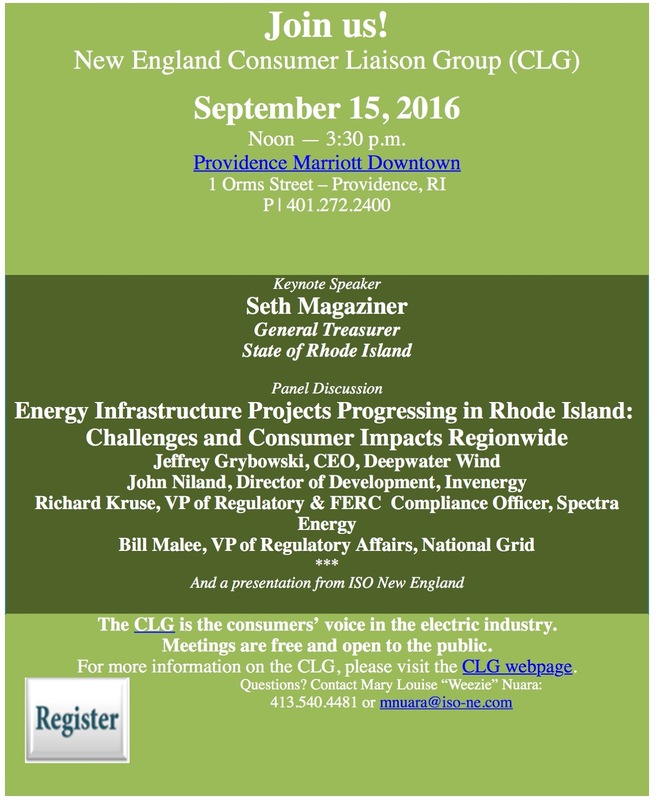 The CLG meeting will be held at the Providence Marriott Downtown on September 15, 2016, beginning at noon with lunch. All are invited to continue this discussion of regional energy issues. To register for the meeting, please click here. The CLG is governed by a Coordinating Committee of up to 12 members with no more than four members from any one of the New England states. The Coordinating Committee sets the agenda for four quarterly meetings each year, which the ISO helps facilitate. Governance of the Consumer Liaison Group is fully explained in the “CLG Purpose and Structure” document available here. I was on Pat MacDonald's show, Vote for Vermont. The motto of her show is "Listening Beyond the Sound Bite." I appeared on her show last year, also. The recent topic was "Life After Vermont Yankee, part 2." We covered a lot of ground, and had a good time! A hearty thank-you to Pat for inviting me on her show, and for all the preparatory work she does before a show. I hope you enjoy watching! In my opinion, gas-fired plants get major subsidies, but they call it "capacity payments." Nuclear plants get these also, but capacity payments are a very small portion of the income for nuclear plants. Capacity payments are a major portion of the income for gas-fired plants. If gas-fired plants had to make their money selling kWh, they couldn't sell kWh as cheaply as they do. If gas plants didn't get capacity payments, but had to make their money selling kWh, nuclear plants would be very competitive, even with currently-low gas prices. My post on the New York Clean Energy Standards: Clean Air versus Efficiency Charges. Clean Air Wins. My article in Nuclear Engineering International magazine, about payments on the grid: Pay for Performance and the US grid.